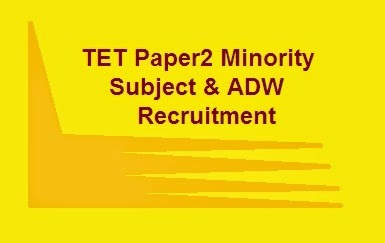 TRB TET | The provisional selection list of minority subjects - published. TRB published the provisional selection list for the appointment of the minority subjects on 14.10.2014 Time: 7.00 p.m. The other subjects selected TET candidates (nearly 12,500) were appointed in their job on 27.09.2014. The minority subject teachers like kannada, urdu, malayalam, Telgu will be appointed soon. For that the TRB published the provisional selection list for the minority subjects in its official website. These candidates will be appointed in the departments of DSE, DEE, Adidravida welfare department by the concern authority soon.Totally we expect 1000 teachers can be appointed in the posts. Teachers Recruitment Board has issued Notification for the Direct recruitment of Secondary Grade Teachers vide Notification No. 06/2014, dated 21.08.2014. The Board has also decided to accept the option of “willingness to join Government Service” already submitted by the candidates at the time of certificate verification of TNTET-2012 and 2013 as application for the post of Secondary Grade Teachers. The Board also releases the provisional selection list for the Secondary Grade Teachers vacancies in Minority Language medium and BC & MBC Welfare Department. The Provisional selection list of Secondary Grade Teachers for Adi Dravidar Welfare Department will be published after the outcome of Writ Petition filed in Madurai Bench of Madras High Court. This is provisional selection list only and appointment order to the candidates will be issued separately by the user department upon verification of their original certificates, degree, etc. Also the list is purely provisional and is subject to the outcome of various Writ Petitions pending before the Hon’ble High Court of Madras and Madurai.